Size of Male: 55-80 lbs., 22-27 in. Size of Female: 45-65 lbs., 21-25 in. The Bluetick Coonhound may not be the most handsome of canines, but it is one of the most empathetic and faithful. Also called Blueticks, these dogs have doleful eyes, a nimble gait, and a trademark coat of speckled white and black which often appear bluish to the naked eye. If you’re scouting for a dog that loves to be petted, hops readily inside your car for a short trip, or makes your hunting trips always productive, look no farther. A Bluetick Coonhound is the right choice. Although the United States is their documented place of origin, Blueticks in fact come from a mixed ancestry of Bleu Gascogne French staghounds, English Foxhounds and Louisiana’s cur dogs. 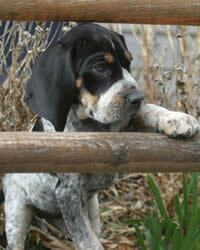 In 1946, Bluetick Coonhounds were recognized as a separate breed, distinct from the Coonhound and the Foxhound. While many breeders opted for hot-nosed and speedy hunting dogs, the Bluetick remained cold-nosed, relatively sluggish and quite capable of trailing very old scents. There is an old-fashioned subgroup of the breed that lives to this very day: the bigger and weightier American Blue Gascons. Blueticks adore outdoor adventures as much as they do their owner. They are curious, well-adjusted canines, regardless of where they are. You’re sure to witness their affectionate nature at home and their relentless zest for tracking game outdoors. The dogs are very good with children but cannot be trusted with smaller, non-canine pets. Living Environment – Blueticks thrive in an environment that offers plenty of space and interactive opportunities. Apartment living is never meant for the dogs. The breed’s loud baying can disturb an entire community! It’s always necessary to block any possible entry and exit points in your yard. Not only do Blueticks have the tendency to wander off, they also sport the propensity to prey upon small animals like raccoons or your next-door neighbor’s cats. Grooming – This dog breed is a continuous shedder but daily brushing isn’t necessary to keep the coat glossy. Weekly combing and shampooing will suffice. Regular ear checks are recommended to prevent, detect and treat scales and possible infections. Diet & Exercise – Voracious eating habits make the breed a candidate for bloating. You can address this by designating a feeding schedule of small but frequent meals. You may also wish to free-feed your pet and provide the dog easy access to some chews and water. The Bluetick’s hunting background makes them a restless breed. They get easily bored and need something to do. Otherwise, they can howl to your annoyance, attempt to scale your fence and chew off things to distress. Daily mental and physical stimulation are a must. Engage your pooch in a variety of games and training sequences. Don’t just take them out for brisk walking; play with them too. Health – Even though they exhibit great vigor, know that the Bluetick Coonhound is vulnerable to some genetic health risks such as cataracts and canine hip dysplasia. Krabbes disease, which is fatal, is also associated with this dog breed. Other than these concerns, most pet owners will find Blueticks to be relatively healthy canines that can live past a decade. As with most hunting dogs, this breed is challenging in the dog training and house training departments. Blueticks are easily distracted by whiffs and smells, and they tend to be obstinate if you are too lenient and gentle. What compounds the challenge is the Bluetick’s sensitivity to harsh words. On the upside, the dogs are very intelligent and are instinctively amazing at trailing exercises. It usually takes a seasoned pet owner to figure out the best method to work with the breed. We adopted a Bluetick Coonhound named Gunner!